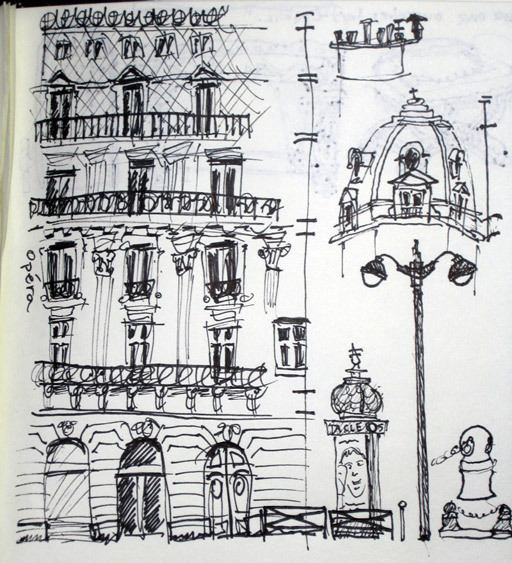 Radiator Blog: France Diaries: sketches + a 3 sentence review of "Game Feel"
The goal isn't to have a pretty picture at the end; the goal is for you to look at this thing, with your eyes, and try to deconstruct why it looks the way it looks. You might think you understand a certain form or certain architecture, but then it'll come to putting lines on paper and suddenly you won't be sure how to begin. You don't need a fancy pen. You don't need an authentic Moleskine(TM)(R), just get some paper and that free car dealership pen and draw. 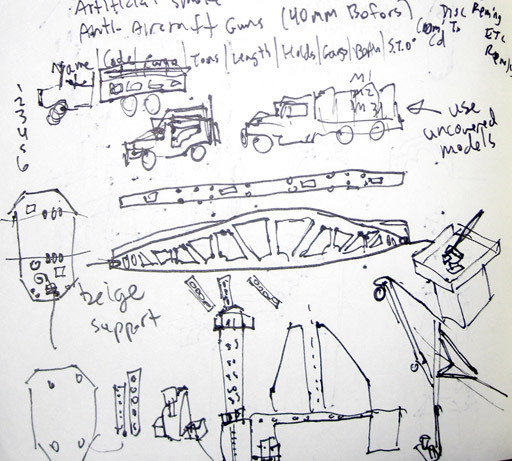 Your sketches need only be useful and legible to you. Photos won't cut it; photos will encourage you to be lazy. Don't be lazy, don't let your brain gloss over the shapes. Even the simplest things quickly become complicated as you think about them more. Also, it's kind of fun to sit in a museum or park and sketch, as an act of performance. Suddenly people will pay a lot more attention to the thing you're sketching. They'll crane their necks to see what you're drawing, wondering silently to themselves whether (a) you're an Artist? and (b) does your sketch resemble the "real" thing? However, the opposite can be just as important: draw without looking, draw from memory, draw from feeling. 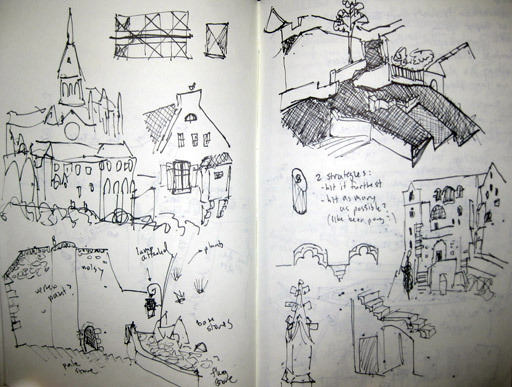 Read Steve Swink's book Game Feel for a master class in drawing as design process, e.g. he draws "screenshots" of Super Mario to help understand its structure and physics. In fact, I'd recommend picking up Game Feel at your nearest library (or interlibrary loan) anyway -- I'd skip most of the text, since he's kind of a verbose writer who's clearly better at illustration -- so look at the pictures and learn from them. Also, if you find the beginning slow-going, then it's not intended for you, so start reading from Chapter 12, that's when Swink starts talking about input curves and goes into case studies. So to review: sketch the visible, but also sketch the invisible. Both will force you to think. A lot. It reminds me of a great quote about writing by Douglas Adams: "Writing is easy. Just stare at a blank piece of paper until your forehead bleeds." Stare at the blank Photoshop canvas, the blank Unity project, the blank UDK grid -- stare until your forehead bleeds. That means you're finally warmed up.